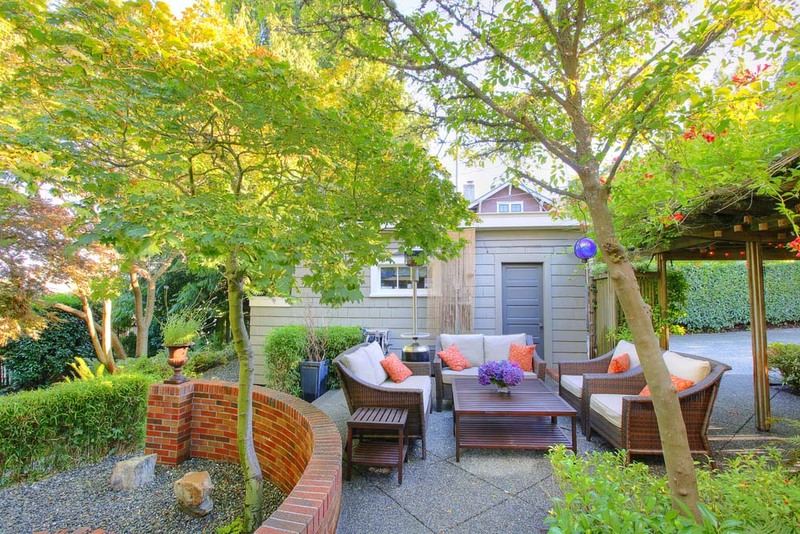 An open patio with dark red brick walling framing a low garden on one side, and limestone bricks around the grill on the other. 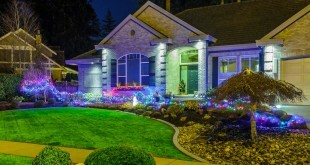 The centerpiece is luxurious cut stone pavers, next to a garden of contrasting colors. There’s ample space for a living area and a dining area, with sensual textiles in dark brown shades. 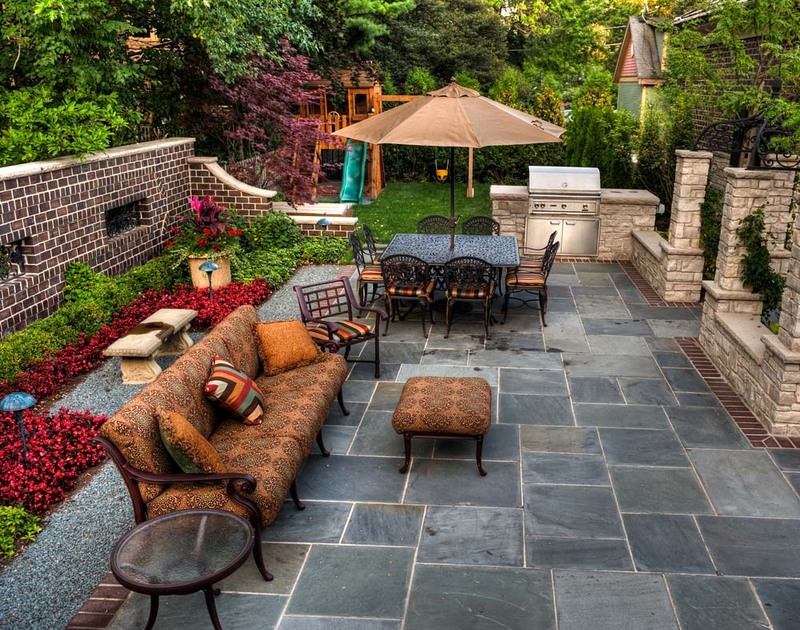 Romance abounds in this patio paved with large natural stone. 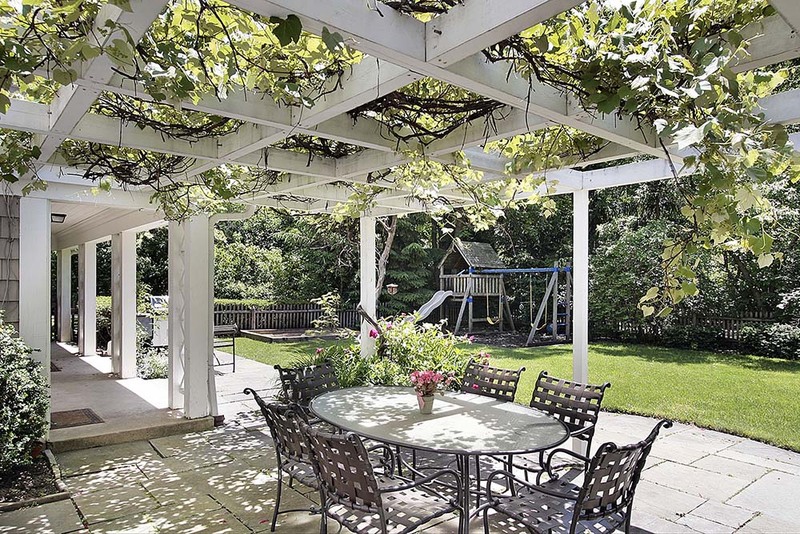 Thedivinely white trellis decorated inswirls of vines provides much needed shade for the dining area. Sophisticated furniture made with treated aluminum and woven synthetic material tie up the dreamy vibe. 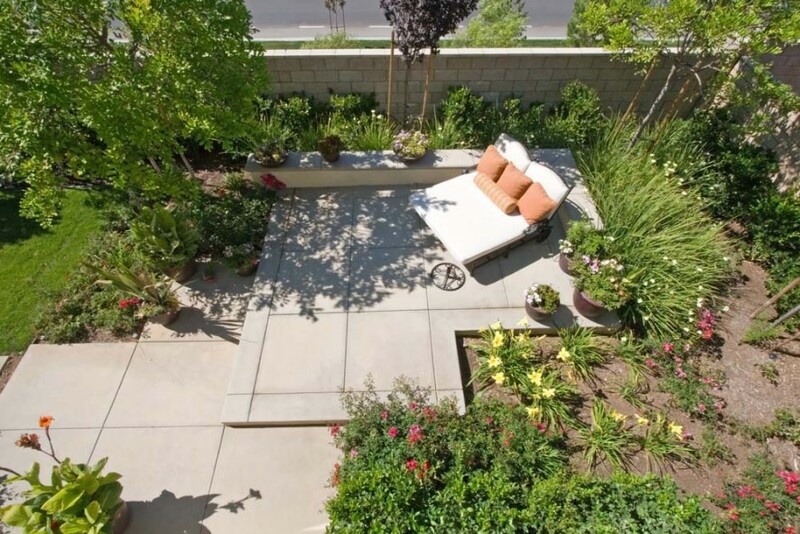 This unique garden setting features concrete paving cut in angles that complement the sophisticated plant arrangement. Another unique feature is the white day bed decked in white and pillows in muted orange. A grand estate with a sprawling garden calls for a wraparound patio, in this case paved in brick that extends to a circular shape. A dining set sits closer to the house, while wheeled lounge chairs lace the curved edges, making them the perfect conversation piece. This majestic mansion features an equally regal terrace walled in stone balusters, and paved in beige tiles. A full sofa set outfitted in subtle shades of tan and green is placed in the center, while an elegant all-black wrought iron dining area sits to the left. 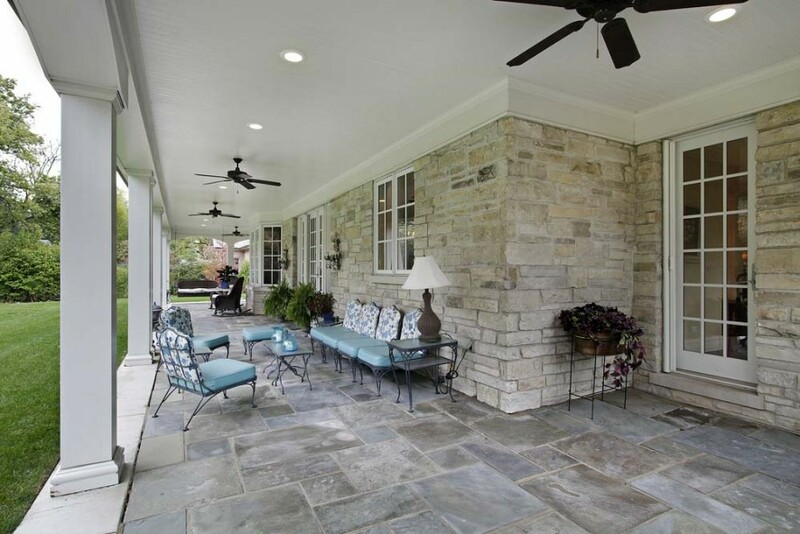 The natural shades of flagstone complement this home’s limestone brick walls. The roofed deck extends throughout one side, with bold black ceiling fans spread throughout the white ceiling. A living area is set in the middle, with seating covered in floral print and dainty shades of pale blue. The focal point of this marble terrace is a traditional fireplace outfitted in warm colored limestone. The décor is kept traditional as seen in the design of the sofa set, while the flat screen television takes the living space into modern times. 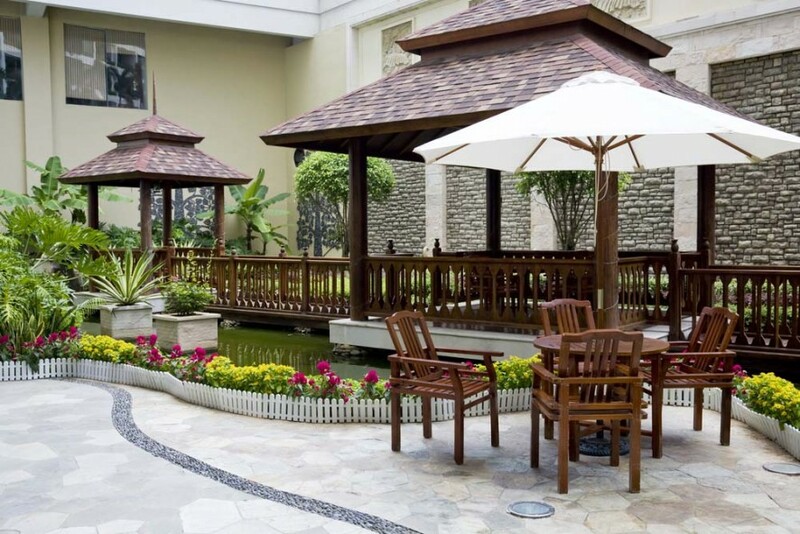 This spacious villa with a built-in pond, and two wooden gazebos connected with a bridge, could very well be part of a tropical resort. Design inspiration from the far East are seen in the choice of dark wood furniture, the carefully selected plants, and the Zen garden design of the honeycomb patterned marble floors. 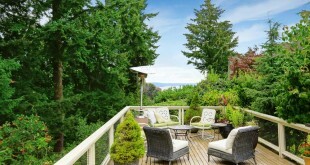 There are many elements contributing to the beauty of this hilltop patio, starting with the carefully arranged garden. 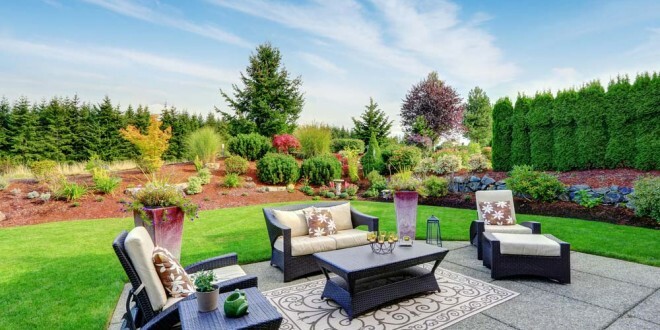 The diamond patterned concrete paving blends with the gravel, and the shades of dark brown and orange in the sofa set stand out, along with the red brick of the curved garden wall. 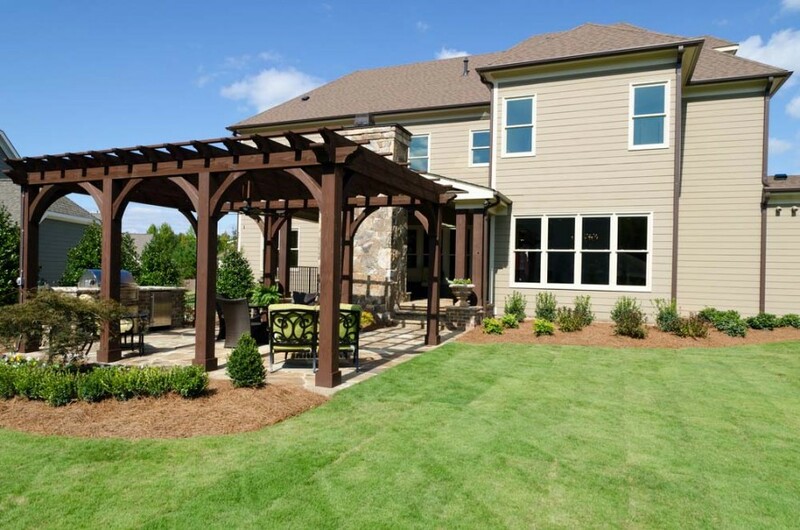 The dark stained wooden gazebo is a perfect centerpiece for this expansive backyard. Natural cut flagstone in varying shades of gray and cream frames the this refined space and showcases not two, but three seating areas plus a hefty grill, encased in brick counters. 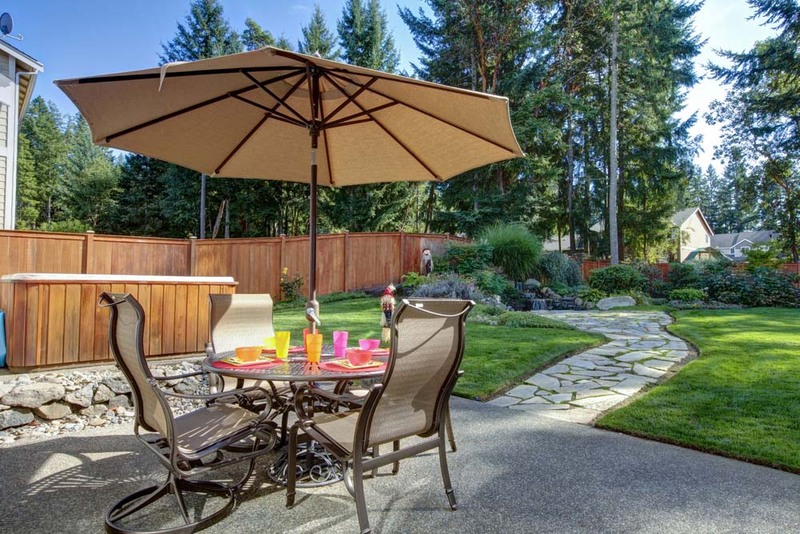 Here’s an idyllic patio setting which features a flagstone walkway leading to a gorgeous garden. The sitting area is paved in pebbled concrete, with furniture in quirky shapes. 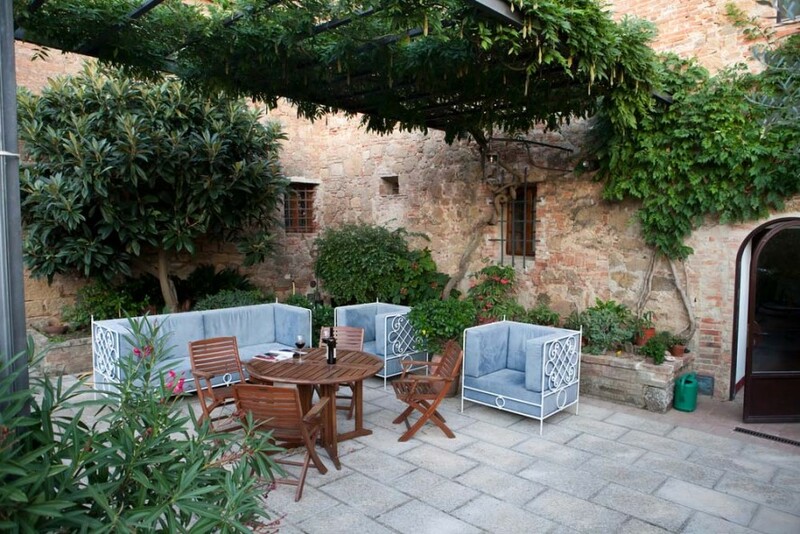 This superb European courtyard is set in stamped concrete, with a dark-colored trellis covered in greenery. Another sophisticated addition is the sofa set with steel blue cushions, contrasted with the warm tones of the teak mini-dining set. 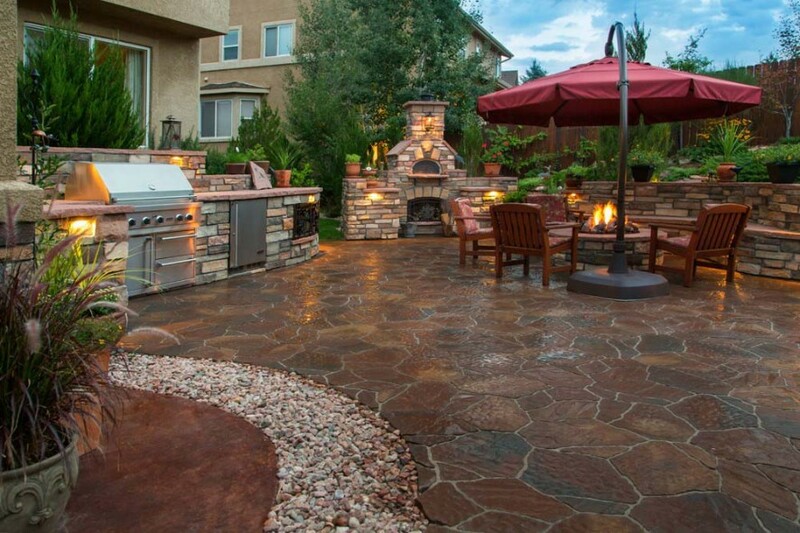 Natural cut and brick stones in varying medium to dark shades are seen in this vast patio. 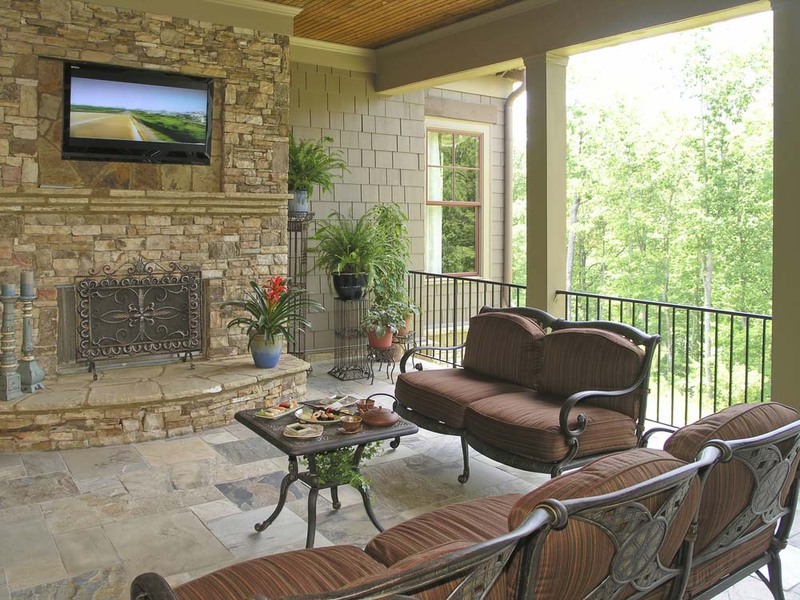 The brick walling extends from a fireplace, framing the living area which also features a built-in fire pit. The same wall material encases the grill and mini-kitchen. 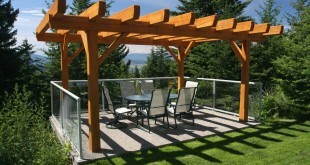 Simple warm-toned teak furniture completes the sensual look.